The thing about R. Balki is that he is a truly gifted man. He has the talent to come up with the most unorthodox ideas, and present them in the most credible manner on celluloid. In his capacity as an ad filmmaker, it is safe to say that he is par none. After all, with a resume, that boasts of some highly memorable ad campaigns, like the heart-warming “Daag Acche Hai” campaign for Surf Excel and the powerful “Jaago Re” campaign for Tata Tea, not many will dispute the extent of his creativity. Unfortunately, this has also been his shortcoming when it comes to feature length movies, as his quirky sense of detailing doesn’t stretch far enough to make an impact on the audience. Therefore, when he takes on the rather contentious issue of gender dynamics in Urban India, one does approach his latest offering with some trepidation. Kia (Kareena Kapoor) is your standard yuppie, working in a senior position at an FMCG firm (thereby giving a lot of scope for product placement, but more on that later), driven, determined and extremely focused on her life goals of becoming the Vice President and possibly CEO down the line. When she meets Kabir (Arjun Kapoor), a laid back, yet intelligent layabout, who seems to lack ambition, thus putting him at odds with his father (Rajit Kapur) who is a big shot builder in Delhi, she is intrigued, and one thing leads to another and they end up married with the blessing of Kia’s mother (Swaroop Sampat), a busy social worker. With Kia focused on climbing the career ladder, and Kabir seemingly content with managing the house, they seem to be a match made in heaven, or are they? From the onset, the first thing that hits the viewer is how uneven the writing is. The movie begins on a rather abrupt note with Kia launching into a rather overwrought speech highlighting the usual clichés about marriage that one notices in modern Indian society. And unfortunately enough, the movie continues in the same uneven tone, leaving the audience highly disoriented with the tonal shifts, not to mention the absolute lack of subtlety in bringing out the latent gender conflicts that usually exist in a marriage. That, combined with the criminally awful characterizations take away from what would have been a truly entertaining movie with a subversive theme. Add to that PC Sreeram’s hyperactive camera-work that gives the impression of a Go Pro attached to a toddler hyped up on sugar, and the highly lacklustre soundtrack by Mithoon, Meet Brothers and Ilaiyaraaja, and one does feel that this is a waste of a great concept. What helps to salvage the movie are the performances here. Kareena Kapoor is saddled with a badly written part, and yet, her vivacity and spontaneity go a long way in making Kia highly relatable. 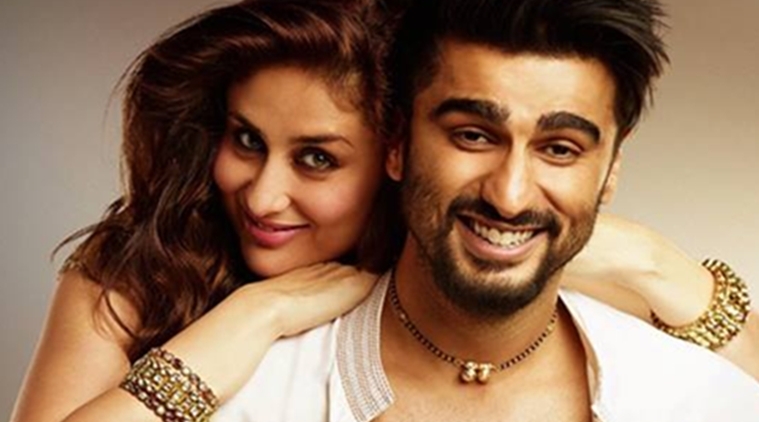 After Ek Main Aur Ek Tu, it is Ki and Ka that has provided her with a chance to go beyond playing the stereotypical love interest, and she pounces on the opportunity. The same goes for Arjun Kapoor, who seems to be slowly evolving as a performer, and makes the role of Kabir highly lovable, with a charming, yet roguish performance. Rajit Kapur as the hassled father is delightful and gets some of the best lines of the movie. But a special mention must be made of Swaroop Sampat, who still manages to light up the screen like she did in the 80s. She is absolutely delightful, and it is quite obvious that she is having an absolute blast in her Bollywood comeback (Her last venture being Saathiya in 2002). Overall, Ki and Ka is packaged quite well, as a frothy light entertainer with a twist, and judging by the reactions of the audience, it looks good to go the distance, but as a topical movie, it sadly doesn’t go beyond being a mere ice-breaker and scratching the surface of an issue that deserved to be covered with more care and depth. ← Breaking News: Deepika Padukone is now part of Baahubali: The Conclusion?